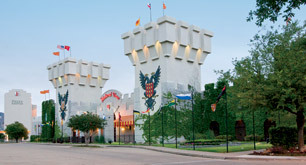 DnBuster's Place: Medieval Times Dinner & Tournament ~ Dallas, Texas!! 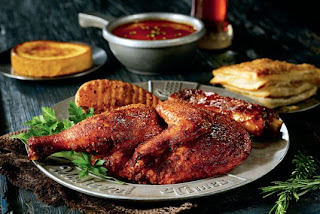 Medieval Times Dinner & Tournament ~ Dallas, Texas!! My Family and I took a day trip to Dallas last week! Medieval Times Dinner & Tournament! If you have NEVER been you must BOOK your tickets today! When you buy your tickets online you will get a FREE Royalty upgrade! That is a $20 value! That upgrade includes Royal Treatment during the feast, VIP seating, a program, cheering banner and behind the scenes DVD!! Check the Medieval Times website often for great deals and specials on tickets! Even without the Royalty package I can promise you will have a great time! The Black and White knight~ Don Iofre Santa Creu - defender of the ancient shrine at Santiago de Compostela. Adorned in Black & White, he is mightiest in skill among an order of warrior priests whose arrival upon the field brings despair to the impure of heart. In prayer, humble. In service, loyal. In battle, invincible! The Blue knight~ As a young squire, Don Alberto del Mau earned his place among the Knights of the Realm in a desperate battle. He struck the enemy and rallied the faithful. Renowned as a champion of the defenseless, his blood will not be cooled, nor his vengeance postponed, for those who bring war and unquiet to Valiente. The Red and yellow knight~Lord del Font - champion to the Count of Perelada! Undefeated, unleashed and unafraid. The sword of this invincible soldier has raised him to fame. Defeat and regret have been the reward of the countless challengers who have offered their honor and their shields to the point of his lance. The Yellow knight~ In defense of Navarre, Don Eduardo del Rey is the rock. Nay, he is the legend. He is well-versed in the arts of chivalry, yet in attack, he is the lion uncaged! Let the ring of steel herald his arrival and the smoke of battle linger in his wake, for a legend of the Realm walks among us. 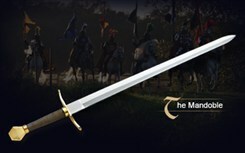 The red knight~ Truest son of mighty Castilla, Baron Ruiz de Roche has been called the "lion's heart" in many a battle. Set him at liberty, and he'll paralyze the enemy! With little pleasure will the ambitious look upon the banner of Castilla hanging in the list. The lion roars in victory and reigns supreme. The Green knight~ A monument stands upon a hill in Leone honoring one man. It bears his name, carved in stone. No warrior of that mighty realm shall ever die deedless thanks to him. The bravest of the brave. The Champion of Leone. Some of the most talented Medieval Times Dinner & Tournament cast members are our horses. We're proud the magnificent stallions are born performers. Nearly all of our more than 400 horses are raised at Medieval Times' Chapel Creek Ranch in Sanger, Texas. Opened in 1991, the 241-acre ranch in North Texas is home to Quarter Horses, Friesians and Menorcans, as well as the Pure Spanish Horses we breed. 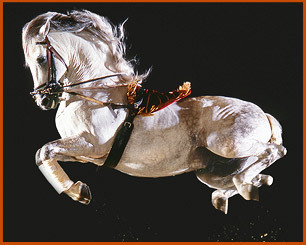 The Pure Spanish Horse was prized by medieval royalty for its astonishing strength, agility and even temperament. Training begins early. As weanlings, Medieval Times horses are introduced to lead ropes and halters. Saddles come at age 2. Long reins and simple exercises such as lunging follow. At age 3, the horses move to their new homes -- one of our nine North American Castles -- where they learn advanced-level dressage from a master horse trainer. Then life as a pampered performer begins. After a few years in the spotlight, the Medieval Times horses move back to the Chapel Creek Ranch. In the serene setting, we make sure our horses live out their lives in royal treatment. A feast fit for a king! Our four-course meal will be sure to satisfy even the hungriest of knights. Long live the King! Our liege. Our lord. His majesty, the King, Don Carlos! He bears the scepter and wears the crown! His kingdom thrives while he sits on the throne and they know no harm will come to them. He desires peace, but will stop at nothing to keep his kingdom and family safe. There's none fairer than the fairest lady in all the realm - Princess Catalina. The King keeps his daughter close because he holds her most dear to his heart. The King would never let harm come to her, nor let her go, until she has chosen the hand of the man she loves. Not one chosen for her. Introduces the Tournament of Knights, where the King's guests will behold incredible feats of skill and daring performed by the brave champions who hail from every corner of King Don Carlos' realm. The Royal Falconer performs wonders with his mighty birds of prey. The tournament includes a live flight of the royal falcon, soaring over the heads of the King's guests - an ancient ceremony dating back to time forgotten. In battle or competition, the best way to unhorse an adversary.Along with the sword, a Knight's lance is his primary offensive weapon. 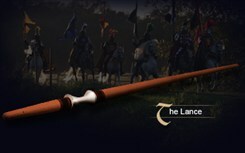 Lances used purely for competition were made to splinter upon impact, reducing the chances of serious injury to opponents during the joust. Light. Maneuverable. 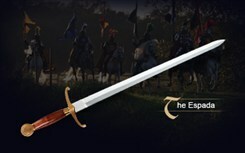 Everything a sword should be.During battle, the Knights used the Espada on horseback or in combination with a shield or other weapon. A heavy, two-handed sword tailor-made for epic swordfights.Because of its heft, 11th century Knights used the Mandoble on foot, often to deal a final blow to an enemy. Versatile, but no less deadly. 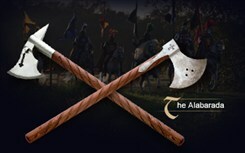 A cross between a battle-axe and a spear, the Alabarda was used to keep enemies at a distance. Should one miss his enemy on the forward stroke, the point on the back of the weapon can be used to stab with a rearward thrust. 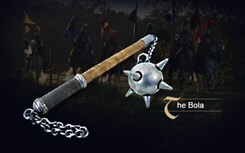 Used on horseback or on foot, it's as fearsome as it looks.By swinging the wooden handle, the spiked ball on the end of the chain dealt a devastating blow to an adversary. 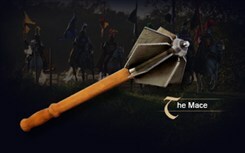 Armor-crushing force at your finger tips.The advantage of using a mace in battle comes from the sheer amount of striking force generated by the pointed weight atop its wooden shaft. The ivy-covered towers of Medieval Times' Dallas Castle add a bit of majesty to the Texas horizon. In regal fashion, this castle boasts nine tree-lined acres complete with a moat filled with schools of live Koi. My Family and I had a WONDERFUL time at Medieval Times! Here are a few pics I took that evening. I have videos posted on YOUTUBE on my channel! As soon as we entered the castle the excitement began! The ceiling of the castle was neat with all the knights colors and symbols. The doors to the castle open an hour and 15 minutes before the show starts! souvenirs to cheer on your knight for the evening! We were seated in our section 15 minutes before the show started! Our knight for the evening was the YELLOW knight! We had great seats! We were on the 2nd row! Within minutes of being seated our server came by and introduced himself to us. soon after the intros the lights went out and the show began! For the entire 2 hours of the show we were entertained! The kiddos ate with their fingers and enjoyed it! Our server was very observant of our needs and refilled our drinks often. Even the younger ones had a great time! I was taking pictures and videos that I forgot to eat most of the time. The half chicken was HUGE! when they hit during the fighting! My favorite parts were the jousting and the falconer! Although, our knight was not victorious that night, he still did great! There was a funny moment when he fell off his horse! The kiddos liked that too.. I give Medieval Times a 5 out of 5! It was entertaining and we had a fun family night! I want to say a special thank you to Synthia from Medieval Times for the tickets for my family and I! I hope we can return to the castle again soon! disclosure: I received FREE tickets to medieval Times Dinner and Tournament located in Dallas, Texas. for my family.. I was NOT required to post a review of our visit~ However, we had such a great time I felt the need to share it with my readers!